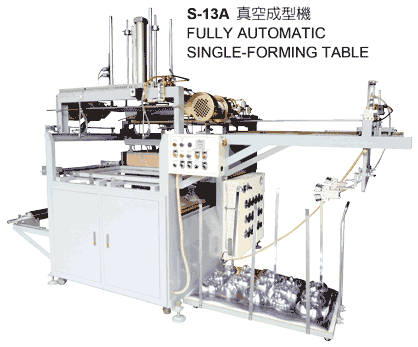 These machine can mass produce packing blister, disposable food container, biscuit tray, ceiling and can use sheet materials of PVC, PS, ABS, PET into various kinds of boxes, cases, such as cake boxes, meal boxes, toys, food holders suitcases, auto parts, sanitary wares, etc. The S-13E have the extra function for skin packing. 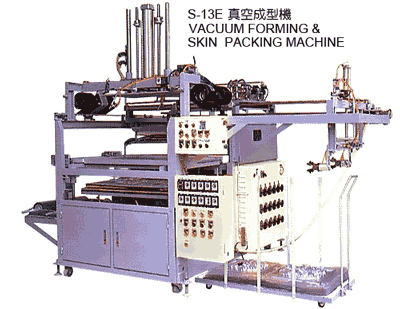 This machine is for the company who need to make packing blister in automatic, and also need to use skin packing machine. However, if the forming production is heavy or frail, operator should take out the products manually. (1) Average heating on sheet: Average Heating is very important on this kinds of machine. Our machine S-13A standard machine will able to work for PC material that is cause the average heating. (2) Lower wastage of material: Our machine wastage material compare with the other company machine will less about 5%. (3) Lower power consumption compare with the other company design. It is very important to saving this kinds not viewable cost for the long time operation this kinds of machine. PVC, HIPS, PS, OPS, APET, GPET, ABS, PP, PE, ACRYL, PC......etc sheet. Training your operator for operation, maintenance, mould making. We will offer lunch / dinner free of charge during training time.